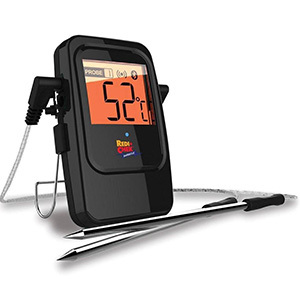 There are many different types of thermometers on the market today that do a fantastic job at giving you an accurate reading of your grill or smoker’s temperature. They can be as simple as instant read thermometers or might have wireless capabilities such as WiFi thermometers. 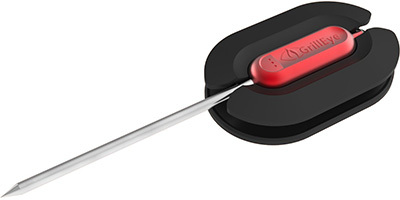 But the most recent (and inevitable) development for BBQ thermometers is to add Bluetooth. We’ll take a look at some of the best Bluetooth BBQ thermometers for the money and help you decide if one is for you. 1.1 What is a Bluetooth BBQ Thermometer? 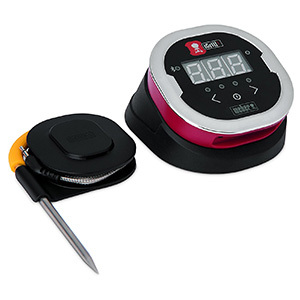 BBQ thermometers with Bluetooth are very similar to all the other thermometers out there. They mostly come with a main control box that connects to probes that monitor the temperature of the pit or food. What makes Bluetooth thermometers unique is that they use Bluetooth to connect to your smartphone. You then use your smartphone as the receiver and can find all the data regarding your cook on an app on your phone. Keep reading to find out the best Bluetooth thermometers and how Bluetooth fairs against typicalwireless thermometers. 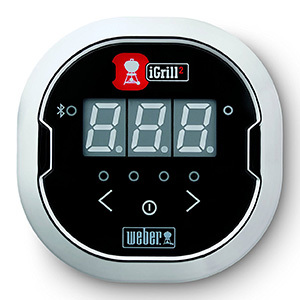 Now owned by Weber, the iGrill brand offer some of the best Bluetooth BBQ thermometers around. 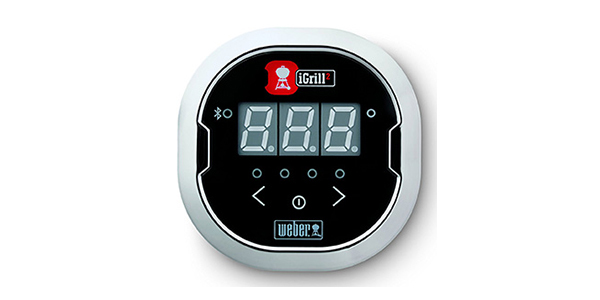 The new iGrill 3 is strangely only available for certain Weber grills so for a universal thermometer that can be used on anything the iGrill 2 is the one to get. This was in fact, designed and built by iDevices, the company that Weber bought the iGrill brand from, and not Weber themselves. Since they purchased it they have updated the accompanying app to something that is a lot more user friendly. The app is now a lot more user friendly, is easy to navigate and has a great range of features. You can name the different probes which allows you to easily keep track of what you’re cooking. There are still some problems, such as when your phone or tablet is locked then the app and the Bluetooth connection drops. This means you need to keep the app open constantly for it to work and means that there is no realistic way to cook over night using the iGrill 2. There are also still a few bugs and it does crash every now and then. It’s better than it was before, but still isn’t perfect. The range is said to be 150ft, which is decent. It is only half of the standard range of other thermometers such as the Maverick ET-733 but is good for Bluetooth. You might still have trouble when it comes to objects in the way which disrupts the signal. You’ll get the best results if you’re in the middle of a field or somewhere open and are doing shorter cooks. A nice feature that the iGrill 2 has, is a proximity sensor. When you walk a certain distance away from the transmitter it automatically shuts off the display to save battery. The transmitter also has room for 4 probes. This is a great feature as it allows you to keep track of a range of combinations of food and ambient temperatures. We generally think that the more probes the better as it will give you the best coverage of the temperatures you’re working with. The transmitter also has a very nice rubber base that has a magnet inside it. This allows you to stick it to your grill and as it’s a lightweight and compact device, it can fit almost anywhere. 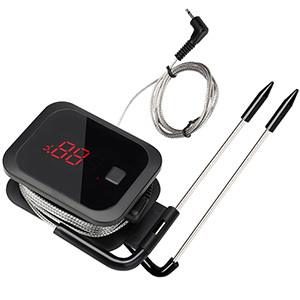 Overall, this is a great option if you’re looking for a Bluetooth BBQ thermometer. It has a good range of features, has one of the most reliable connections we’ve used and is generally a very accurate and versatile thermometer. It does have the usual problems that all Bluetooth thermometers have. The connection is much less reliable than something like a WiFi connection or radio frequency. It drops every now and then and the range is just alright, despite the advertised range of 150 foot. Also, having to keep your phone or tablet open is surprising annoying, and if you’re using a Samsung Galaxy (and possibly other Android devices) you can’t keep your phone unlocked indefinitely, which means you’ll have to be checking on your app every few minutes just to keep it open. This takes away the whole point of a wireless thermometer if you’re checking on it just as much as you would a standard thermometer. Having said that, when the iGrill works, it works very well. If you’re doing some quick grilling in the middle of nowhere with no walls between you and your grill then the iGrill 2 is a perfect choice for a BBQ thermometer. Maverick are well known in the BBQ world for their high quality of meat thermometers. The ET-732 and the newer ET-733 are two of the best digital thermometers available today and the ET-732 is the standard against most other thermometers are compared. With the ET-735, Maverick have tried their hand at the Bluetooth thermometer market. The ET-735 has a lot of the features that make Maverick’s other thermometers so popular, such as food presets, timers, stopwatches and temperature alerts. It also has a the ability to monitor any combination of 4 meats or grills using Maverick’s hybrid probes. These are waterproof, 36 inch probes that have specially designed heat resistant wires. In our ET-733 review we found this to be one of the weak points of the product and they are almost exactly the same here. When they work, they work great, but there are a lot of reports of the wires simply failing. Whilst we’re talking about the bad points of the ET-735 we’ll go into the worst problem of the lot. The Bluetooth connectivity. Maverick claim that the range is 160 foot, but this simply isn’t the case for most people. If the transmitter actually manages to connect to your mobile then the range is much less than 160 foot. And if you have walls or anything else in the way then you’ll be looking at even less range. It’s the same problem as the iGrill, Bluetooth simply isn’t strong or reliable enough unless you’re close with no interference. You’ll see that this is the case for the next two thermometers as well. Overall, the Maverick ET-735 is a great thermometer when it works. You have to be a lot closer than advertised for the signal to hold and you’ll have to be constantly checking your phone to keep it awake. The Redi Chek app works relative well, it’s clear enough and gives you a good amount of control. It’s probably the best app for Bluetooth thermometers we’ve tried. Like the iGrill 2, the Maverick ET-735 is a good choice if you’re cooking in the middle of a field with no obstructions and you’re planning on doing quick cooks. Any longer cooks or smokes using this are not going to happen. The Inkbird Bluetooth BBQ thermometer has many of the features that some of the more expensive thermometers have at under half the price. It has the usual free app to accompany it. This is surprisingly good, it’s clear and easy to use. It also has many presets that can be customized, timers and temperature alarms. The range is said to be 150 ft, but again this isn’t the case in reality. You’re realistically looking at a maximum of about 50 – 100 ft. This range is only possible if you’re aiming the transmitter directly at your phone with a direct line of sight. So it’s a bit awkward to get that range, but it’s manageable. The signal holds fairly well considering the price of the thermometer. It held up just as well as the Maverick ET-735, which is over double the price. Overall, the Bluetooth and app side of this product is decent, it could be better if I’m being picky, but it could also be much worse. With the transmitter, you get two temperature probes included with a maximum of two being supported. These aren’t as durable as others we’ve tried and are not water proof, so you’ll have to be careful when washing them. They are fairly accurate though and work just as advertised. The transmitter is small, light and looks good. It’s easy to use and to set up and is even covered by a 12 month warranty. Whilst this isn’t the highest of quality and there are some problems with the Bluetooth connectivity, the Inkbird is a very good value thermometer with some great features and accurate probes. If you’re not looking to spend much and only need two probes then we see no reason not to buy the Inkbird over the other thermometers we’ve tried. It’s a great little package and a very reasonable price. 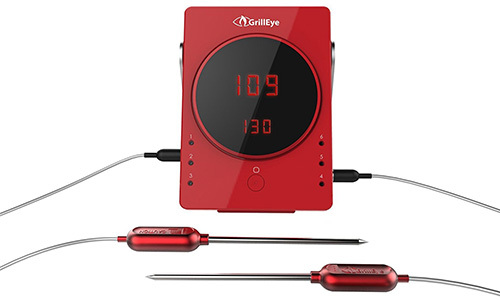 The GrillEye is one of the first Bluetooth thermometers that has space for 6 meat probes! We generally think that the more probes the better, and having the ability to use 6 probes is brilliant. The probes themselves are some of the best we’ve seen and are made from stainless steel and aluminum. You get two with the GrillEye and additional probes can be bought separately. They are generally very accurate and have some nice features themselves. For example, they come with a flame proof grip and every probe that you buy from GrillEye will come with a mounting clip so it can be used as an ambient thermometer. The transmitter of the GrillEye is one of the best looking transmitters we’ve seen, it has a striking design that is simple, clean and quite elegant. Made from plastic you’d expect it to be somewhat flimsy, but it feels strong and durable and comes with an aluminum stand so you can place it anywhere. The screen is simple as it is only two numbers, but it’s quite reflective and in direct sunlight it is difficult to read. This isn’t a huge problem as the GrillEye excels when using its accompanying app. The app is simple and easy to navigate. It looks good and is very simple to use and set up. GrillEye claim that you’ll be able to get a 300 ft range from the Bluetooth transmitter. But again, this isn’t the case. The range and signal is up there with the iGrill but it isn’t quite as good as advertised, unfortunately. Overall, this is a great product that we’d love to be able to give a proper review of. The option of having 6 probes is brilliant and gives you a huge range of possible data to get the very best cooking experience. It also looks stylish, is very accurate and easy to use. It has a few small problems here and there, and we think if those could be fixed and maybe some more additional options and functionality added to the actual transmitter, then this would be the best Bluetooth thermometer ever. The biggest difference between the two is the method by which they transmit the data. For the majority of situations radio frequency (RF) will beat Bluetooth. The range of Bluetooth is simply not enough and the signal is generally much weaker. Having said that, there is the huge convenience of not having to carry around a receiver with Bluetooth. Instead, everything is on your phone in a much more user friendly experience. Having to use an app with a Bluetooth thermometer means that the company you buy it from will be able to continuously update and improve the experience of the app. This means that after buying it you will likely be able to get new features completely for free. This is something that simply isn’t possible on most of the RF thermometers available today and will help add a lot of value to your Bluetooth thermometer purchase. Bluetooth thermometers require a smart device to use properly. Not owning a smart device makes them almost completely useless as a lot of them don’t have any functionality without the accompanying app. RF thermometers tend to be a bit cheaper. This is very dependent on the specific thermometer you buy, but generally you will pay less for an RF one. If you’re having trouble with Bluetooth then try and remove any obstacles that might be blocking the signal. Metal, glass, brick walls and other wireless devices can all have a big impact on your Bluetooth signal. Try to remove these and have a direct line of sight to the transmitter from your phone. Make sure you look after your thermometer well. Don’t leave it out in the weather, be careful of high temperatures, push all the connections in enough and read the instructions if you’re stuck. Find the maximum temperature rating for your new thermometer and make sure you keep underneath that. Excess heat is the biggest killer of meat thermometers. Also, try to not touch the metal grid with the probe. This can be significantly hotter than the surrounding air and can easily damage your probe. Keep the tips of the probes nice and clean. A build-up of carbon on the tip can insulate the sensor, giving a false reading. Obviously, this is bad for cooking, but it also increases the risk of overshooting the maximum temperature. Simply grab a wet sponge and wipe off any carbon you see. Don’t fully submerge the cables though as this can easily damage them. The best way to use your new Bluetooth thermometer is to use it with our times and temperature charts to make sure you cook your meat to perfection. Make your life easier by choosing a good cut of meat in the first place. Read through our guide on the best meats to smoke for more information on picking the perfect meat. Bluetooth thermometers can be the ideal type of thermometer for certain situations. If you’re not sure whether they will work for you, we’d recommend reading our digital thermometer guide to get a better understanding of the options available. If you have more questions about Bluetooth thermometers or anything else on our site then please leave a comment and we’ll get back to you as soon as possible. This review of the GrillEye was a year ago. Have you used it more since and can give an update review? Considering this for a gift. Thanks so much! Unfortunately we haven’t used the GrillEye since this was written. We’ll look into getting another one to update the review!